Click here for just the posts about my weight loss. I hope you'll be inspired! I've always felt that having a high level of faith is one of my best assets. But a big faith is not the same as a crazy faith! After hearing John Waller's story, maybe you and I will be inspired to stretch our faith, to awaken crazy faith within ourselves! I enjoyed speaking with him about his song that I've enjoyed playing on Hope FM, and learning more about Crazy Faith Coffee. It's more than just selling java, it's sharing the crazy faith stories of people who dared to step out and do something big. And it's helping to raise money to accomplish great things. Here's a super fun video of the song. Plus! He'll be coming to Palatka for a concert on Sunday August 20th at 6pm at Grace Fellowship. We'll have a chance to check out his coffee and his music. Hope you'll join us! Welcome! 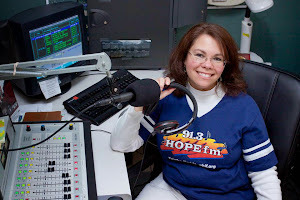 I'm on the air weekday mornings from 7-10 on 91.3 Hope FM. This blog is a way for me to pass along some of the things you hear on the air, like quotes, recipes and contact info for special guests. It is my joy and privilege to serve listeners a daily dose of HOPE through music and ministry. I have had the joy of serving as the sign language interpreter at my church. I'm very happily married to Stacy and have the world's greatest weenie dog, and a jack russell terrier that likes to compete with her for snacks and our attention. The Happy Song by Delirious?